Vince Lombardi drew a huge crowd in 1970 at his funeral, following his untimely death from cancer. The Vince drew another big crowd today in the historic old streets of Boston, Massachusetts. The late, great coach may have never spent much time in Boston, but the trophy that bears his name is awfully popular since Pete Rozelle created the reason for that trophy to be awarded. Up until Tuesday, The Vince had never known or seen Boston. But make no mistake, The Vince knows now. The Vince met some 1.2 million new people today, and every blessed one of them screamed like crazy when eyes met trophy. From Boylston Street to Tremont Street to Congress Street to Government Center to City Hall Plaza, the biggest conclave of Patriot Nation ever assembled came out on a frigid day to salute their raison d’etre, the World Champion New England Patriots. It was loud, fanatical, crazy, and just plain ecstatic. Everyone who saw the parade, who heard the speakers, who watched the television replay of Super Bowl XXXVI at City Hall, and who danced along with Ty Law and chanted along with Adam Vinatieri, will never forget this stunning event. To say nothing of the stunning event of 48 hours ago that begat this stunning event. Whether you watched it live or on television, you really had to take a good, long look at this whole thing. You’ve seen this happen in cities like Dallas and Green Bay and San Francisco. You’ve also seen this happen in St. Louis, Baltimore and Washington. This is a rite of passage in New York in October. But this is Boston, and you’re seeing a victory bash. And we’re not talking about some unwelcome Ray Bourque farce. This is the real deal. This is the time to party, and party they all did. The Celtics had a run of five parties like this, two in the seventies and three in the eighties. Larry Bird told a frenzied throng his exact opinion of Moses Malone. But other than that, it was merely a bunch of happy fans, 90 percent of whom likely weren’t at their first such event. The last of those was sixteen years ago. The long time continuum was enough to make this celebration a biggie. But this being the NFL, and all the prestige that goes with it, and this being the initial championship in Patriot history, and given the team they beat, and given the way they beat them, and given the way the game ended, this celebration turned into a gala that the Red Sox may not be able to top if they ever manage to win a World Series someday. The Red Sox. That party may have to wait a few lifetimes. Willie McGinest costs the Patriots a game-clinching touchdown a la Bill Buckner, and the Rams storm back off that gaffe to score 14 quick points to tie the game. And the Patriots still won the whole damn thing. There was no wimp job in Game 7 or Carl Yastrzemski flying out to Geronimo or popping up to Nettles. Vinatieri and Tom Brady delivered the greatest moment in the long history of Boston sports. Today’s bash reflected this incredible game and that incredible moment. The parade of Patriots on duck tour busses began at Hynes Auditorium, and proceeded at a snail’s pace along the half-mile route. It took an hour to reach City Hall Plaza, and nobody cared. The throng of screaming fans along the parade route got a good look at Bob Kraft holding the Vince, Bill Belichick, and all the players who showed up for today’s event. Not that any one player ought to be happier than another, but how must East Boston’s Jermaine Wiggins feel, riding with the Patriots in a victory parade in the streets of his own city? The ceremony, once the motorcade reached the dais at City Hall Plaza, lasted only twenty minutes or so. This was disappointing. Twenty minutes was not enough. Why can’t political conventions be this short? Who wouldn’t want to hear one of the players deliver a Barbara Jordan/Mario Cuomo-type keynote address? If President Bush can deliver a speech with pauses every thirty seconds for applause, so can Bob Kraft. And Kraft is probably the only human being right now who has ‘president’ as a title with an approval rating higher than Dubya. Gil Santos emceed the event. Gino Cappelletti chipped in his two cents, then Kraft came up to address the crowd. CMGi Field will be Kraft’s lasting legacy to the region. The new digs are already being hailed as the best football venue in the nation when it opens this fall. But today was Kraft’s true moment of high triumph. 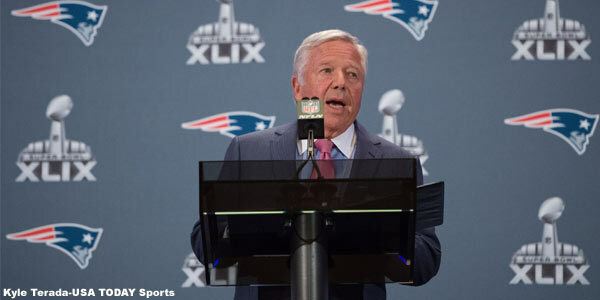 Kraft declared to everyone that “We all are World Champions!”, and held the Vince aloft as the crowd roared in ecstasy. The man who went from fan to stadium owner to team owner to championship owner won a prize Sunday that no stadium can overshadow. Belichick got perhaps the biggest ovation of all the speakers. Declaring that “This is our time!”, Belichick exorcised all demons left over from his failed venture as head coach of the Cleveland Browns, as well as the big shadow from Belichick’s long time mentor, former Patriot head coach Bill Parcells. Belichick’s victory moment vindicated his entire coaching career, being able to hold the Vince aloft when most everyone in these parts five years ago thought that it would be Parcells doing this some day. Of the team captains, Larry Izzo, Lawyer Milloy and Troy Brown spoke. Drew Bledsoe was in Montana with his family, and missed this event. Tom Brady was part of the celebration but did not speak. Milloy made everyone chant “We’re number one!”, and Ty Law made Bobby Hamilton, Brady, Belichick and Kraft do his touchdown boogie. It sure beat the heck out of that old Redskin Fun Bunch. And we’re not sure why, but Izzo led the crowd in a derogatory cheer towards the Yankees. New Sox owner John Henry thanks Izzo for whatever leftover mojo the Patriots have to offer. Vinatieri was perhaps the best speaker of all. He gave a terrific dissertation on team disrespect, and taught everyone the newest Boston catch phrase, “Don’t talk to me!” Clean-shaven, the man who kicked the greatest field goal in Super Bowl history was all smiles today, perhaps thinking as much about the new contract someone will soon give him as he was the massive throng thanking him for kicking the Patriots to a world championship. The ceremony ended, more screaming and celebrating continued, and then everyone began to disperse and head home. No one would be blamed if the celebration were still going on. You could have paraded every player, coach, executive, and anyone who in some way is employed by the Patriots to come up and talk for ten minutes, and that still might not have been enough. The old saying “enough of a good thing” does not apply here. This is one party that ought to never end. You looked at this celebration, thought of the reason for the celebration, and you still can’t believe that this is all happening. Part of the experience is “you never thought you’d ever see this”. The other part is “you may never see a celebration like this ever again”. It is that big, and it is that unbelievable. The Patriots and their fans will ride this one for a long, long time. This was too much fun to follow all season long, too much fun to watch the AFC playoffs unfold in the snow and the ketchup, and too much fun to watch the Patriots conquer the Big Easy. Guys like Scott Pioli and Belichick have already gone back to work, and the expansion list has been turned into the league office. Ted Johnson took in the festivities today, even though he was one of the five players who might become Houston Texans next year. McGinest’s holding penalty was perhaps his last notable act as a Patriot. But the fans will keep on screaming and partying. And a lot of bragging, too. As Milloy said, we’re number one. 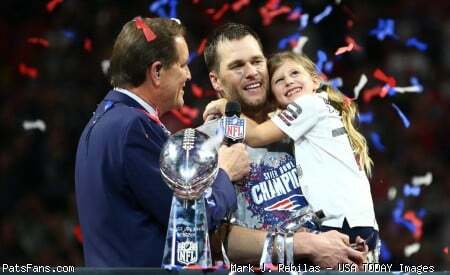 Thus begins the reign of the New England Patriots as NFL champions. This entry was posted in Uncategorized on February 6, 2002 by Bob George.